A family pass is an excellent savings for those with more than two school-age children. 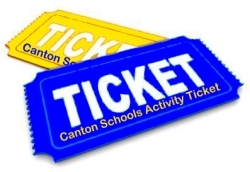 All tickets are non-transferable and good for admission to ALL Canton High School sponsored activities. They cannot be honored for district and region sport events, including the Big Sioux Tournaments. * Single event tickets can be purchased at the gate. * Golden Age C-Hawk Pass for Senior Citizens. Must be over age 62 . Passes may be picked up at the HS Office.